LeBron James or Betsy DeVos? If you could pick from two candidates to be nation’s secretary of education and those were your candidates, whom would you pick? That is the point of an online petition posted late Tuesday on Care2.com and titled “LeBron James for Secretary of Education.” By midday Thursday, there were 11,348 signatures, and the surge of signatures caused organizers to keep increasing their goal. James, arguably one of the best professional basketball players around, has been in the news recently for more than just his move from the Cleveland Cavaliers to the Los Angeles Lakers. His family foundation recently helped fund and open a public school for at-risk children in Akron, Ohio, a move public education advocates applauded. James chose to open a traditional public school, not a charter school. 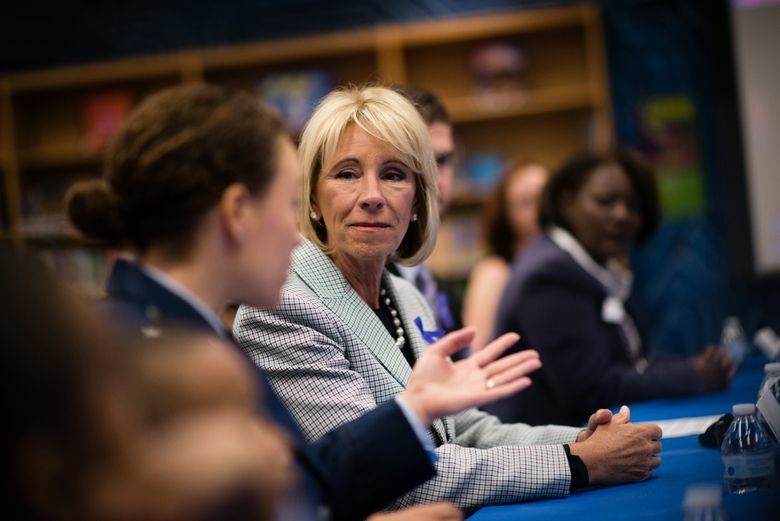 Charters are publicly funded but privately operated and a favorite of DeVos. LeBron James for secretary of education? The U.S. president is a former reality show host and businessman whose companies filed for bankruptcy six times. He opened up the for-profit, non-accredited Trump University that is defunct. The school triggered lawsuits amid accusations of fraud. Trump settled for $25 million. DeVos is a Michigan billionaire who spent decades supporting alternatives to traditional public schools, never attended a public school, never sent her children to one. You can decide how far-fetched it seems: Education Secretary LeBron James.